Excel Services: Unable to process the request. Wait a few minutes and try performing this operation again. This error message appeared in a SharePoint 2010 farm/environment when trying to use Excel Services to display a Excel spreadsheet in SharePoint 2010. Screenshot in English: Excel. Unable to process the request. Wait a few minutes and try performing this operation again. Screenshot in Swedish: Excel. Det går inte att behandla begäran. Vänta några minuter innan du försöker utföra den här åtgärden igen. 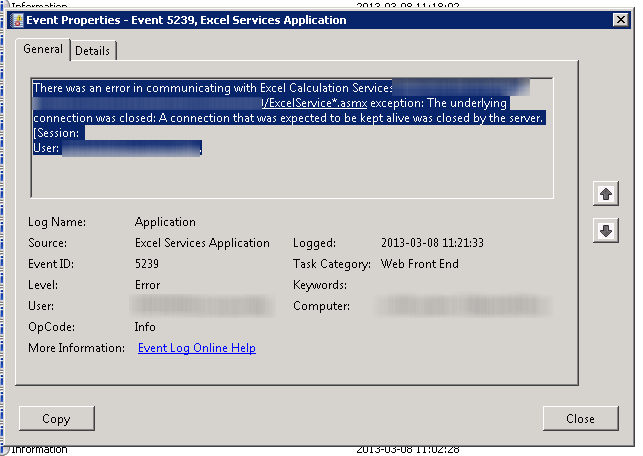 Event Viewer: Event 5239, Excel Services Application. There was an error in communicating with Excel Calculation Service (server address on port 32843, standard port for web services address ending with /ExcelService*.asmx) exception: The underlying connection was closed: An unexpected error occurred on a receive. The issue was that the web site used for the SharePoint Web Services had the ASP.NET Impersonation Authentication method enabled. The solution is to disable the ASP.NET Impersonation again. Go to IIS Manager (Start, Administrative Tools, Internet Information Services (IIS) Manager). Expand the Sites node on the server running the Excel Services Service Application. Choose the Authentication icon in the IIS area. Choose ASP.NET Impersonation in the list and disable it using the action link on the right hand side. Screenshot: IIS Manager, Authentication settings for the SharePoint Web Services. This entry was posted in General on 2013-03-09, Saturday by Stefan Johansson.